Taken from the 10th century Tale of Ise, episode 9, this scene represents the self-exile of Ariwara no Narihira. As they pass Mt. Fuji they stop "...to admire an un-seasonal coating of snow." According to some accounts, Narihira felt the need to leave the capital because of an unauthorized marriage or liason with a woman of high ranking. Here are passages translated from episode 9 of The Tale of Ise by Helen Craig McCullough. "Once a certain man decided that it was useless for him to remain in the capital. With one or two old friends, he set out toward the east in search of a province in which to settle. Since none of the party knew the way, they blundered ahead as best they could, until in time they arrived at a place called Yatsuhashi in Mikawa Province. (It was a spot where the waters of a river branched into eight channels, each with a bridge, and thus it had come to be called Yatsuhashi - 'Eight Bridges.')" Later McCullough continues: "At Mount Fuji a pure white snow had fallen, even thugh it was the end of the Fifth Month. In a footnote it says: "In the lunar calendar the end of the Fifth Month fell between mid-June and mid-July." 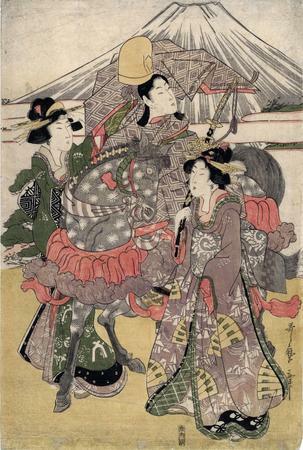 We should note that there are any number of prints by other artists with similar scenes of a Narihira figure on horseback accompanied by beautiful women. One of them by Toyokuni I in Boston is dated from the 11th month of 1804 and is said to be based on a contemporary kabuki play based loosely on the Narihira theme. There are at least four prints in the Lyon Collection that include some representation of Narihira. Although we don't ascribe any particular significance to these design motifs, it should be noted that both women have images of fans on their robes. The one on our right also has origami birds. Also, note the oddly shaped hat on Narihira's head. It is an eboshi worn by high ranking courtiers in the Heian period and later. In fact, many spectacular military helmets mimicked this shape during the Momoyama and later eras.